Are You Looking for Access to Census Tract Data for the 2010 Census, 2000 Census, or the American Community Survey? We can help. We've compiled step-by-step instructions to guide you through the process, including an option on how to navigate the U.S. Census Bureau's American FactFinder online tool (with three examples for accessing Census Tract data), and an option to let Cubit do the heavy lifting for you. Whichever option you choose to get American Fact Finder Census tracts data, we hope we've made your search a little easier. Click here and complete the short form at the bottom of the page. Hit "Submit." Cubit's industrial-strength data-finding, table-crunching, and excel-spreadsheet wrangling tools will pull your data fast. We'll email you back questions and a quote. Typically within 24 hours, you'll receive an Excel file with your data and citations. Do-it-Yourself - Using the U.S. Census Bureau's American FactFinder Tool. Instructions for Option 2 include three examples depending on the source of the census tract data you need: U.S. Census 2010, U.S. Census 2000, or the American Community Survey. Click on the "Show Me All" button. Click the "Topics" box on the left-hand side of the page. Click "People" from the list of options. Click "Race & Ethnicity" from the list of options. Click "Hispanic or Latino" from the list of options. Your data selection will be listed in the "Your Selections" box at the top of the left-hand column. The list of data tables and other products will be listed in the "Search Results" box in the center of the screen. Close the Select "Topics" box by clicking on the "Close X" button in the upper right corner of the box. Click the "Geography" box. A Select Geographies box will open. At the top of the box, choose either: most requested geographic types (for a shorter list) or all geographic types (for a comprehensive list). Click open the Select a geography type scroll bar. Select Census Track 140. Click open the Select a state scroll bar. Select California. Click open the Select a county scroll bar. Select Los Angeles. Click open the Select one or more geographic areas scroll bar. 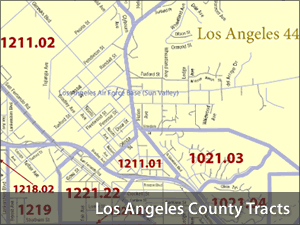 Select the top option: "All Census Tracts within Los Angeles County, California." Click the "Add to Your Selections" button at the bottom of the box. Close the Select "Geographies" box by clicking on the "Close X" button in the upper right corner of the box. The complete data selection for Census 2010 Race and Ethnicity data for Los Angeles County will be listed in the "Your Selections" box at the top of the left-hand column. The list of data tables and other products will be listed in the "Search Results" box in the center of the screen. Select the data sets that you are interested in, such as "Language Spoken at Home by Ability to Speak English for the Population 5 Years and Over (Hispanic or Latino)." At the top or bottom of the screen, click View, Download, or Compare, depending on what you want. If you chose to Download the data, select if you want the data and annotation in a single file or separate files, or if you want it to include descriptive data element names. Also choose your preferred presentation-ready formats, either PDF, MS Excel, or Rich Text Format. Because you want Poverty data, you need to pick Census 2000 Summary File. Go to the "What We Provide" section, and click on the blue "get data" option net to "Decennial Census." Click "Poverty" from the list of options. Click "Poverty" from the list of three options. Click open the Select a state scroll bar. Select Texas. Click open the Select a county scroll bar. Select Harris. Click open the Select one or more geographic areas scroll bar. 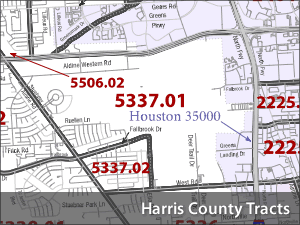 Select the top option: "All Census Tracts within Harris County, Texas." The complete data selection for Census 2000 Poverty data for Harris County, Texas, will be listed in the "Your Selections" box at the top of the left-hand column. The list of data tables and other products will be listed in the "Search Results" box in the center of the screen. Select the data you want from the list of data, for example, Poverty Status in the Past 12 Months by Age by Language Spoken at Home for the Population 5 Years and Over. Under the "What We Provide" subhead, you'll find a bullet point for the American Community Survey. Click the blue "get data" option. Pick the American Community Survey data set that you are interested in. (IMPORTANT NOTE: American Community Surveys 1-year and 3-year data sets DON'T have Census Tract level data. You must select a 5-year ACS data set to get Census Tract data. To select a data set, check a box on the left ID number for the data set you want (i.e. 2005-2009 American Community Survey 5-year Estimates). For more information about any of the data sets, click the "i" in the circle under about. Click on the table, file, or document title to see the data set. To select the type of data you want, click the "Topics" box on the left-hand side of the page. For income data, click the "People" from the list of options. Next, click on "Income & Earnings." Select whether you want Households or Individual income. Click open the Select a state scroll bar. Select Illinois. Click open the Select a county scroll bar. Select Cook. Click open the Select one or more geographic areas scroll bar. 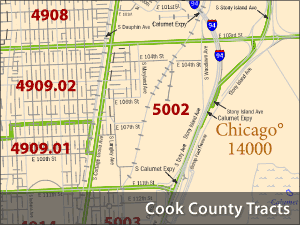 Select the top option: "All Census Tracts within Cook County, Illinois." The complete data selection for American Community Survey Race and Ethnicity data for Cook County will be listed in the "Your Selections" box at the top of the left-hand column. The list of data tables and other products will be listed in the "Search Results" box in the center of the screen. Select the data sets that you are interested in, such as "Household Income in the Past 12 months (in 2009 Inflation-Adjusted Dollars) By Value."